Governor of Poker 3 Free Your quest to become a poker pro will take you on a long journey through Texas. From poker rookie to the high-roller VIP of the Gold area! Battle for the Galaxy Battle for the Galaxy is a great massively multiplayer online strategy game set in space. Turn your humble outpost into a grand empire! Total War: Arena Ride into immense 10 v. 10 player battles in Total War: Arena and experience spectacular historical land battles like you've never seen before! Klondike Get ready for a very meaningful journey… you will enrich your life experience - Klondike! Goodgame Big Farm Combine business instincts and farming fun when you rebuild your uncle George’s farm. Bingo Multiplayer Get your bingo cards ready: It is bingo time all over the world! Family Barn Build and organize your own village and become the best farmer in town World of Tanks Join the team-based massively multiplayer action and command historically accurate mid-20th century tanks in battle! RageWar Play the new modern strategy game RageWar for free and wage war on the violent Barbarians! Poker Live Pro Play the Texas Hold'em game Poker Live Pro and test your skills against other live players from all over the world! Golden Acres Golden Acres is a fun farming sim in which you can build and customise your own farm, and share and compete with your friends! Call of War Win the Second World War using your most cunning stratagems and war tactics in Call of War! 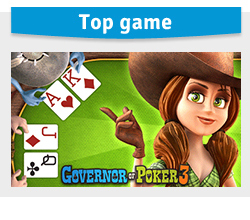 Goodgame Poker Play Texas Hold’em with a twist and take on the world from behind your poker table Monster Mahjong Hurry up and make your way through the magic forest... where monsters and mahjong challenges await you! My Kingdom for the Princess 2 Defend the realm against invaders as adversity strikes the kingdom once again!